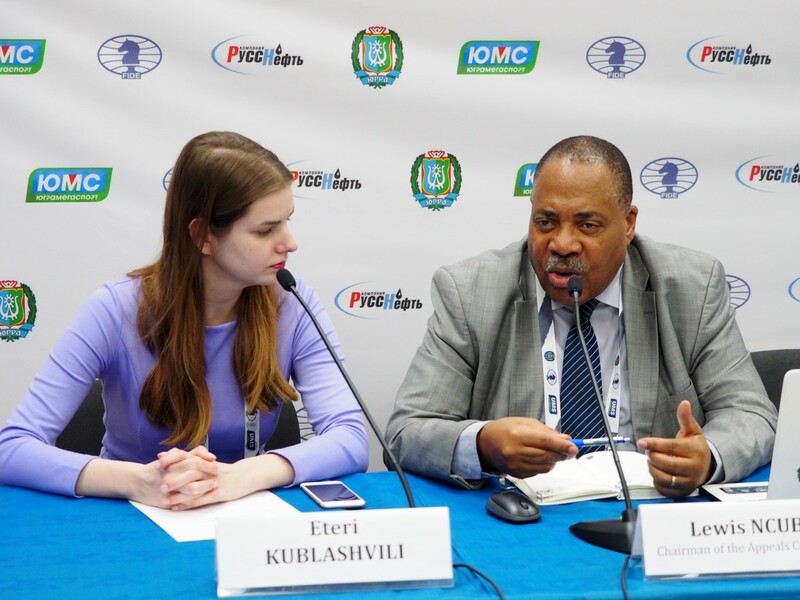 The Chairman of the Appeals Committee, Continental President for Africa Lewis Ncube answered the questions of the press-officer of the tournament Eteri Kublashvili. – Is it your first time in Khanty-Mansiysk, Lewis? – No, actually it is my third time here. I first came to Khanty-Mansiysk during 2010 for the Chess Olympiad and after that we had a Presidential Board meeting so this is the third visit I have here. – Do you like being here and what do you think about the climate of Khanty-Mansiysk? – The climate is obviously not suitable for me. But sometimes it is good to appreciate other kinds of weather. It is quite cold here. When we came it was around -36 here, it is the coldest temperature I’ve ever experienced. First time I came to Russia, to Moscow, in 2006, and at that time the temperature was -26. For me -26 and -36 is almost the same. It is a good experience, but you need to be more prepared for it. I had to buy one or two small things to get warmer. In my country which is the other way round it is about +30 at the moment. But in any case, it is ok and a very good experience for me. As for all the other things like accommodation and everything else – they are really well-done. – What are your impressions of the event as the Chairman of the Appeals Committee? – At this level of the tournaments normally you don’t have too many appeals. Basically, chess is a very disciplined sport. Players respect each other no matter how strong their rivals are. No matter how much they want to win most of them will not cheat. There are very few complaints. I think in my time as a FIDE official at the highest level I was only involved in 1 appeal in a match during the Women’s Championship in Nalchik. And there it was basically an appeal against the decision of a chief arbiter. So normally you don’t get any strong appeals but you have to be prepared for that anyway. As I’ve already said this is because of the nature of chess. Even without an arbiter players respect each other and their play. – From the spectator’s point of view, do you prefer men’s or women’s events? 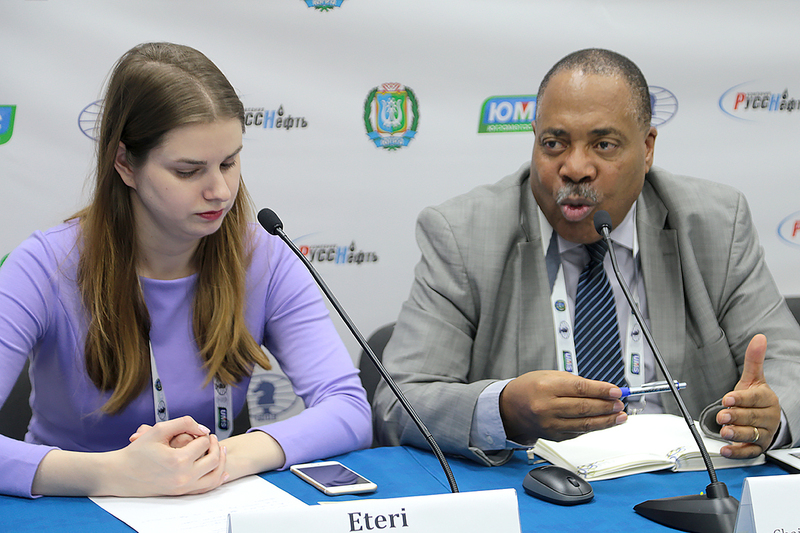 – As an official I think that we are not doing enough to support women’s chess. We should do much more. Some people think that women’s chess is not as good as men’s. The fact is, we do not put enough resources into women’s chess and we need to do much more. The fact that top men’s and top women’s players are not on the same level is not because of the abilities of women. But it is more to do with how much over the years we as officials and a society do not put enough resources into women’s chess. Even at home, in families if a boy player is excelling in chess you will most likely find that parents put more emphasis on that. They do not really explore how great a potential of a young girl is. So as an official, I believe that we should do much more for women’s chess. There’s no scientific explanation or evidence that women are less likely to become top chess players. Sometimes you have a tournament and not that many young girls or women turn up. By the way, as for my family, my daughter plays chess. She represents her University as a chess player and feels very passionate about it. – Please tell us about chess life in Africa. – In Africa we have a lot of challenges. In terms of our governments they have so many obligations to care of concerning health, community upgrade, infrastructure, so sometimes they do not find enough resources to put into chess. But sometimes it is also up to us as administers to put a proposal that is acceptable. You need to convince the sponsors and the government to put money into chess. We don’t always have to rely on government. 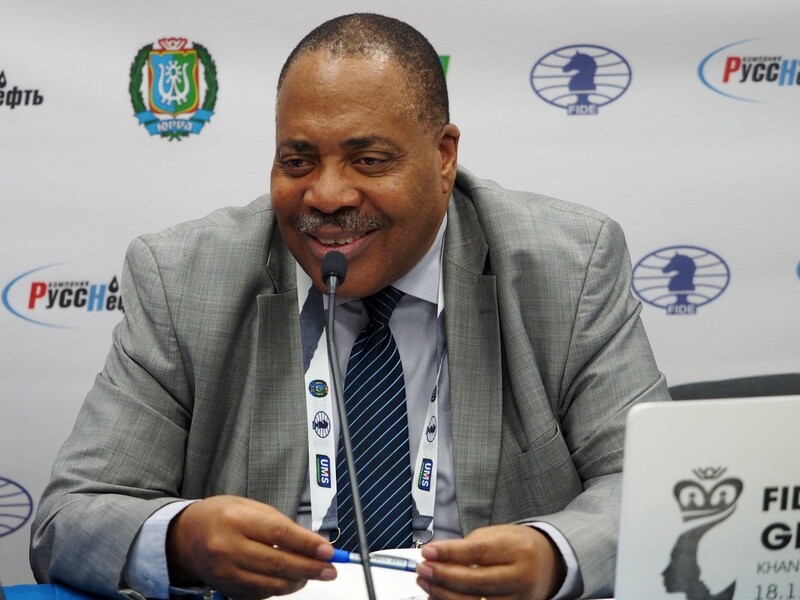 There are a lot of companies that operate within Africa which are making a lot of money and they should put chess as a part of their corporate responsibility. That is the area that we need to push forward. But I believe that in 5 or 10 years the number of challenges we are facing will lessen. When I came here I watched what they are doing and how the chess academy works here. It makes me realize that we have a lot more to do. But we are up to the challenge and I am sure that me and my officials in Africa are really capable of developing chess in Africa. It is a big challenge but we are able to do that.